PCGamer - "New Bordeaux is a gorgeous-looking backdrop." GamesRadar - "Mafia 3’s core action meld and merge with dynamically satisfying ease, it's the connectedness of the game's wider, meta systems that really fleshes out the sense of New Bordeaux as real place." Set in New Bordeaux during 1968, Mafia 3 attempts to echo the same vibe as New Orleans in the late 60’s. This time you’re playing as Lincoln Clay, a veteran of the Vietnam war as he vows revenge on the Italian Mob. This classic tale of revenge in the Gangster genre is not something that often comes up in games, and Mafia 3 is right on track to hit all of the right marks. Sporting an amazing licensed soundtrack, the sheer amount of verisimilitude that Mafia 3 can offer is brilliant. Who doesn’t want a bit of Credence Clearwater Revival playing as you shoot up the Italian Mob? Additionally, gameplay is pretty open-ended, meaning you are free to breathe and take in all of New Bordeaux’s sights at your leisure. Take over locations, interrogate your enemies and much more in this dark Gangster tale set during the Swingin’ 60s. 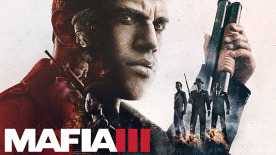 Recently we had the opportunity to site down with one of the developers from Firaxis and discuss everything Mafia III, click here to find out more! 2K have announced their upcoming post release content/ DLC for Mafia 3. All the information you need to know on how New Bordeaux will expand, including new weapons, cars, areas and story missions is on the Green Man Gaming Blog. With the release of Mafia 3 around the corner and Pre-Load Now live, we decided to look in to the officially licensed Soundtrack. The Community team have chosen their 10 top favourite songs to come with Mafia III, and what you will be listening to on the Streets of New Bordeaux. The community team discusses what they are most looking forward to delving in to in New Bordeaux, what weapons and vehicles Lincoln Clay will take revenge with on the Italian Mob and what aspects of Mafia 3 they are most looking forward to.